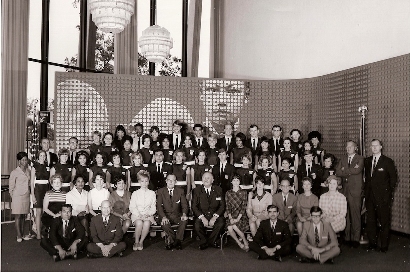 Hemisfair 1968 - U.S. Pavilion Story. 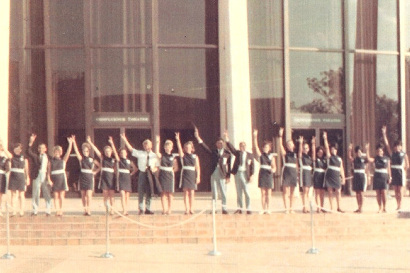 Forty five years ago I was interviewed and hired as a United States Pavilion guide at Hemisfair '68 in San Antonio, Texas. I no longer live in my hometown of San Antonio but often, usually in the spring time, I mentally transport myself back there. I miss San Antonio at that time of the year because I think of how party time will soon begin. Fiesta in San Antonio! In my mind's eye, I am strolling along the river or eating at some downtown restaurant or enjoying festivities like a Night In Old San Antonio. Mostly I recall a very special year when I was a young adult. In 1968 I was eager for change and adventure. That year was a brief oasis time for some of us who worked at Hemisfair. The fair occurred during a turbulent time in our nation's history and was set against a backdrop of an election year, social change, and the Vietnam War. Emotions were high on many social and controversial issues. For some of us who worked at the fair, it was a time between jobs or for others a hiatus from college. Most certainly it was a questioning and growing up time for many of us seeking employment at the fair. Hemisfair was a transition time of six months between what came before in our young lives and what would come after. My job as a representative and guide at the United States Pavilion has remained an important time and a very happy memory in my life. This opportunity might never have occurred. To the dismay of my parents, I quit college in another town in February of 1968. Nothing seemed to be going well in my life and, when you are 19 years old, your problems are usually blown out of proportion. Being tired of my classes and saddened by the departure of a friend for Vietnam, I could not see or wanted to see beyond the next day let alone the next year. Since I already had a junior standing with excellent grades, I pleaded with the dean of girls and my parents to allow me to withdraw and go back to the safety of home and San Antonio. The real world reared its' ugly head as I buried mine. An advertisement in the newspaper concerning the completion and opening date of Hemisfair appeared shortly after my return home and there was a call for qualified guides. None too soon for me, since my half-hearted attempts at looking for a job coupled with "taking to my bed" with just "feeling bad," was gaining sympathy from Dad but was trying the patience of Mom. I made an appointment for an interview to be a U. S. Pavilion guide but did not have high hopes of getting the job. I met most of the requirements but I was not in the age range of 20-27 or so, which was required of protocol and regular guides at that particular time. Everyone I saw who was being interviewed appeared to me to be more mature and experienced. My lack of self confidence must have been well concealed and my enthusiasm evident because, regardless of my age, I was notified that I was hired. I was never told why but I assumed that I had made the right impression and was the type of person they were looking for in young people they were hiring to represent a federal pavilion. Maybe what helped was the fact that I had two years of college credit and had an ability to speak a foreign language. The adventure began with a training period in March before the fair opened on April 6, 1968. The United States government participated in the six-month world's fair along with other nations and private industries. There were other types of pavilions and, of course, there was the Texas Pavilion. The U.S. Pavilion was very large and consisted of an exhibits building, a beautiful courtyard called Migration Courtyard, and a theater with three lobbies called The Confluence Theater. The pavilion was operated by the U.S. Expositions Staff of the U.S. Department of Commerce. The exhibits building had many displays which included such items as Joe Louis' boxing gloves and Ty Cobb's bat. The Migration Courtyard was large and set against the back was a wall with falling water with sixty sculptured birds in flight. San Antonio artist, Bill Bristow, created the birds which symbolized the migration of people. The theater was visited by thousands of people and was a very popular destination at the fair. The theater had flying screens and walls that disappeared into the ceiling. The screen was called a 37 x 140-foot curvilinear and was the only one of its kind in the world. The documentary film was entitled "US" and was 23 minutes long. It was created and produced by Academy Award winner Francis Thompson and and his associate, Alexander Hammid. People coming to see the film were directed by guides to three different lobbies to wait for the completion of the film that the previous crowd was viewing. The film ran continuously every day for 6 months except when there were technical problems that had to be fixed or occasional threats. After a speech was given in English and Spanish, (I often did this when my group rotated from exhibits building to courtyard to theater) guests were led into three individual theaters. After some opening scenes with actual footage of people on boats arriving in America and passing the Statue of Liberty and arriving on Ellis Island, footage of the Wright Bros. etc�.the audience would then hear a jet airplane and that is when the screen would enlarge in each theater and then eventually the curtains that divided the theaters would come up and the screen became full size in a panoramic view for the 1,200 seat capacity audience to be amazed by. This film could only be seen in the Confluence Theater as no other theater in the world was equipped to show the film. It became a controversial film, as some criticized some of the negative aspects represented. Others considered it to be a very worthwhile film and praised it. There were daily Hemisfair updates in the newspapers in San Antonio. Fair attendance and Tower of the Americas attendance along with admission price and times of events were publicized. Many of the events were free including the pavilions of different countries. The U.S. Pavilion often received heavy coverage. Many events took place in the courtyard and on the steps of the theater. When President Lyndon Johnson made a 3 hour visit to Hemisfair, the story was front page news of course. I was there the day of the event and it was quite exciting. When President Johnson arrived at the U.S. Pavilion for an Independence Day speech, thousands of people jammed the Migration Courtyard. One hundred policeman and many secret service men kept a close watch. That was one day that I remember many guides absolutely put on the white gloves that we were supposed to wear but never did! There was a 21 gun salute that rattled the glass of the Confluence Theater and the Air Force Band of the West played "The Eyes Of Texas." President Johnson also viewed the film. Countless politicians, diplomats, royalty, and celebrities attended the fair. Billy Graham attended as well as Jack Benny, Bob Hope, Glen Campbell, Andy Williams, Herb Alpert, Bill Dana, Joan Crawford, Wayne Newton, Jimmy Dean, Mills Brothers, Dale Robertson, Roy Rogers and Dale Evans, Louis Armstrong, Bill Cosby and Vikki Carr to name just a very few! There were performances by the Bolshoi Ballet. Often, with working there, I was unable to attend some of the events and shows or often just too tired and wanted to go home. However, there was entertainment often in the U.S. Pavilion courtyard�..dancers from various parts of the world, singers, and one time the Mormon Tabernacle Choir sang on the steps of the U.S. Pavilion. What a thrill to hear their voices. In many ways Hemisfair was a success story that revived a downtown area that has, since that time, steadily seen change and growth in the tourist industry. The Confluence Theater where the controversial film "US" was shown and where I spent so much time greeting visitors was long ago converted to a federal courthouse. Many years ago everyone on the pavilion staff who managed to stay the entire 6 months of the fair received a letter of appreciation from the United States Department of Commerce with a booklet describing the federal presentation. The book contained information on the planning, politics, financing, content of the film, the staffing, the delays, and the problems. I have kept the letter and booklet all of these years and find it a source of pride and happiness that I was a small part of such a grand undertaking 45 years ago. Old newspaper clippings, Life Magazine clipping, pictures of guides and dignitaries, special invitations for events involving the U.S. Pavilion are all treasured keepsakes of a special time in my life that I keep in a scrapbook. To think that leaving school for a few months could land me a job that was educational and fun and allowed me to earn some money for the first time in my life has made me thankful and aware that special opportunities come sometimes at the right time and place. What happened to the buildings, the film, some of the people? Some of this I know but mostly wish I knew more of what became of all of us guides. What I know for sure is what the Hemisfair experience gave to me. I learned that I loved working around different people every day. Tourists are usually an exciting, happy, interesting segment of the population. A job involving the general public is a great teacher of human nature and I learned how to be diplomatic and friendly under stress and learned what real class is and what it is not at an early age. I learned that people be they diplomats, politicians, kings, celebrities or ordinary citizens are all just people when they are enjoying themselves as tourists. I learned first hand that the way people are treated has a direct relationship to how they treat others. I learned that people could be haughty and rude at times but a calm approach can diffuse some bad situations and that I looked forward to a new experience every day and that life is not always fair and that people have different feelings and outlooks on life, political beliefs, and opinions based on personal experience, education, and upbringing. I learned that if you do a good job people notice and, If you are sincere, people pay attention and I learned that the show must go on rain or shine! Working and socializing with people of varied backgrounds during Hemisfair helped me mature and grow as a person. I came to realize that meeting or seeing some famous people on a regular basis, knowing how to spot a secret service man a mile away, having my picture taken for the newspaper, being interviewed by a TV station, being a part of the excitement when the President of the United States paid a visit, or being invited to a party given by the Governor of Texas�.ALL would one day come to an end. LIfe would go on when the final day in October came! Spring to Fall. Poetic justice for beginnings and endings. Happiness and expectations versus sadness and leavings. It was time to go back to school for some of us (me included), a time for some to change jobs or go back to Washington, a time for some to get married, and a time for others to follow their husbands wherever the armed services took them. Though the events at Hemisfair seem like they happened only yesterday, I am no longer that cute young guide but rather a wife and mother of 3 grown sons and grandmother of 4. The decisions that I made during those final days of October of that year have indirectly or directly influenced the rest of my life. If I could just have that job now! I swear I no longer shun the color of navy blue which we wore. If someone told me that my uniform was too short, maybe now I would listen. At this stage of my life, I could probably do almost everything required that I did back then except that I would refuse to look for phantom objects beneath theater seats after a bomb threat. I would have to tell them to find someone else! Though I loved the work that I did at the pavilion there were certain aspects that were boring and tiresome at times, but we guides had youth and spirit on our side. We carried out our responsibilities as guides knowing that we were having fun as well as representing the federal pavilion that was a big draw at the fair. On some days, crowd control became a major function of the job and a people counter and diplomatic skills and not a college degree helped with that. The daily entertainment in the courtyard from all over the United States and the world for those waiting to see the film was memorable as was all the interesting tourists that visited Hemisfair. A memorable occasion for me was when Princess Grace and Prince Rainier of Monaco came to view the film. I stood at the back of the theater as they entered before the rest of the audience and to this day I still remember how truly beautiful and gracious Princess Grace was. For us guides, I believe that the show WAS the people or the events that took place every day. We had a front row seat for just about everything imaginable and every day was something new. Although certain holidays were extra special, looking back I think that my job was like the 4th of July every single day. The "pursuit of happiness" is supposed to be our "unalienable rights" as Americans. I don't think I have ever fully or vigorously pursued it as much as I did in 1968, when every day was like the 4th of July and all my tomorrows were supposed to be that way.